The second weekend of Jazztopad climaxed with a pair of major performances in the main hall of the National Forum Of Music. 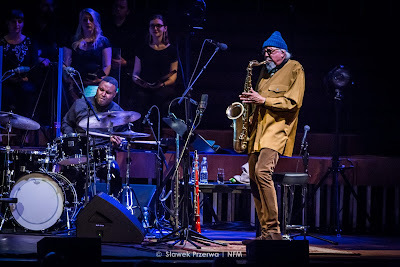 On Saturday 25th, the US composer, saxophonist and flautist Charles Lloyd premiered Red Waters, Black Sky, commissioned by the festival, and featuring his quintet, right at its heart, flanked by the Lutoslawski Quartet and the NFM Choir. This extended work primarily reflects on Lloyd’s partly Cherokee heritage, and despite its mournful title, the suite is dominated by a spiritually uplifting, reflectively calming aura for most of its duration. Lloyd is fast approaching his 80th birthday, and is still playing with strength, control, sensitivity and authority. So much so that many of the best sections of this new work revolved around his actual solos on tenor saxophone. The addition of the singers in particular, and to a certain extent the string quartet (as arranged by Mike Gibbs), often sounded like they were attached as separate entities rather than woven into the general musical spread. The choir parts had the feel of a late 1960s flower power movie soundtrack, but without the benefit of an exotica kitsch style. There were times when I was simply yearning for a straight quintet gig, as it was these core combo stretches that provided the most affecting musical moments. It’s not clear whether the sporadic blandness was down to a problematic relationship with the vocal interpretations, or whether the mood of sweeping Hollywood drama was intended as a more positive evocation of this unavoidably tragic history. There was one section, with the quintet alone, that revealed a more turbulent nature, effectively backdropped just by minimalist footage of rippling blue waters, potently incongruous when partnered with the distressed sonic spread unfurling in front of the screen. “We are driven from our home, we have no more land,” the choir sang, but without the required dark character and melancholy weight. The other strongly individual soloist was Greg Leisz, on pedal steel, firstly forming an odd contrast with the choir and string section, and secondly, creating an unusual floating cowboy resonance to meld with this narrative, partnered by the mellower solos of guitarist Bill Frisell. Contrastingly, the final night of the festival found Herbie Hancock delivering a set with no particular concept other than to reflect his past funkier side, mainly concentrating on material from the 1970s albums. Again, this was a controversial set, as post-show canvassing of opinions between fellow critics and musicians revealed your scribe to be in a distinct minority, having considered the performance to be a reasonably strong offering from our veteran keyboardist. The main obstacle to contend with was an overly loud mix that swallowed up the bass frequencies, and spat them out as deep gruel. Fortunately this didn’t hamper the frequencies mostly preferred by Hancock and multi-instrumentalist sideman Terrace Martin. This being the third occasion that I have witnessed the Herbie band since July, it’s remarkable to note that the current tour-that-never-ends is already undergoing heavy evolution. The band line-up is now cut back to a quartet, guitarist Lionel Loueke having departed (thereby markedly reducing the wash of electronic effects) and drummer Vinnie Colaiuta now replaced by hip-hop sessioneer Trevor Lawrence Jr., who brings a more straightforward beat to the proceedings. The flowing funkiness has been honed and directed in streamlined fashion. Yes, there’s a vocoder obsession, with Hancock and Martin infesting nearly every number with their weebly vocalising, but the bandleader’s own solos were particularly vigorous, involving extended explorations with complex escalations, and a remarkably percussive attack. Martin was at his most striking when playing saxophone, and Hancock was also in an outgoing, humorous shape, as he nonchalantly quizzed bassman James Genus about his new footwear. How many times have we ever heard that kind of banter, in our history of gig-going? Hancock’s bond with the crowd was strong, his energy levels high, and by the time of the Rockit encore, he was strutting to the front with his keytar strapped on, and actually jogged offstage twice, in a grand show of 77-year-old denial.